LuxCloud, a Luxembourg-based leader in cloud services provisioning, is pleased to announce a new strategic partnership with European service provider Perrit to further expand its offering. This new collaboration will see LuxCloud’s catalogue grow to include the latest versions of the most in-demand cloud services and provide several new support options to partners. Perrit brings to the table strong experience and a large portfolio of services, as well as the possibility of provisioning services in different EU countries. Launched in 2003, it boasts a large network of reseller and direct clients that include large corporations and public utility providers. LuxCloud partners will soon be able to benefit from an expanded catalogue of services, beginning with the 2016 editions of Microsoft Exchange, SharePoint and CRM. Additionally, LuxCloud will soon offer its partners a wider range of support options, including fully managed services and the option of 24/7 technical support. This new contract with Perrit is the first of several steps LuxCloud is taking to ensure the continuation of a high quality of cloud service delivery for its resellers, and is one that will result in increased service availability, improved customer support and an improved choice of products and services. 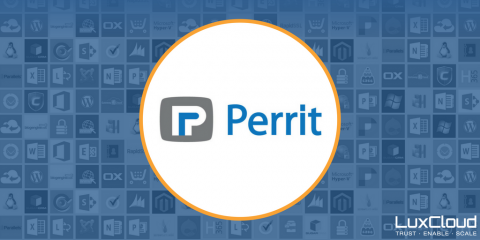 Perrit delivers hybrid cloud business solutions, ranging from reliable process automation for release, deployment, provisioning and billing scenarios to Enterprise Grade Portfolio Management. Public and private companies across all industries rely on Perrit’s service offerings including all standard Microsoft services, online and partner-hosted service bundles and a broad range of ISV solutions. LuxCloud is a market-leading provider of cloud computing services, allowing companies to quickly launch and profitably deliver the cloud services demanded by small- and medium-sized businesses. LuxCloud offers customizable branded solutions enabling resellers, system integrators and service providers to sell online any and all of the services and applications available on the platform.